The last part of today’s stage was a long straight uphill drag that had us guessing right to the line. It wasn’t a steep climb but was enough to weed out the weaker riders and make those with GC ambitions show their cards. Current leader Alejandro Valverde (Movistar) was driving hard and sacrificing himself for team leader Nairo Quintana on the lower slopes but when Joaquim Rodriguez (Katusha) attacked only Chris Froome (Sky) could match him. 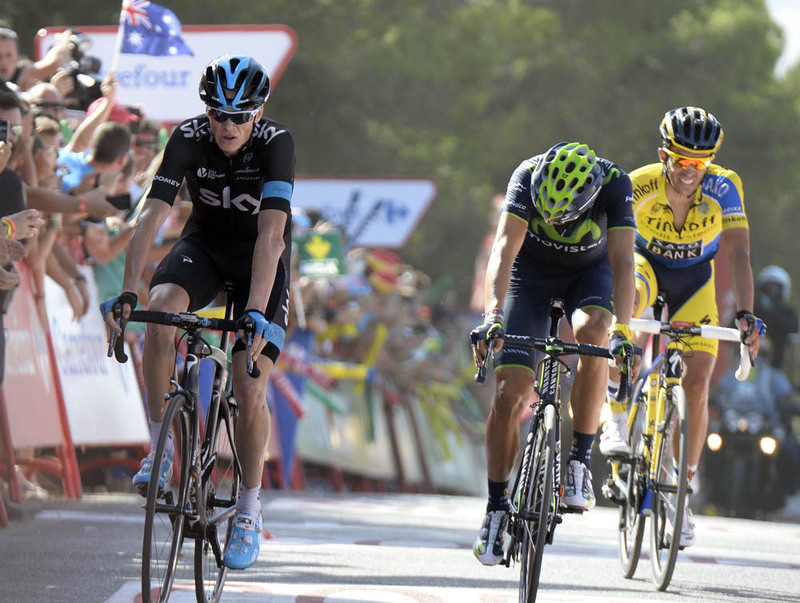 Alberto Contador (Tinkoff-Saxo) bounced his way out of the saddle over to them but Quintana couldn’t match them. There was enough time for Valverde to claw his way back up to the leaders to take the stage win but his team leader finished 12 seconds down on all the other favourites. And this was all in the practically the last 2kms! 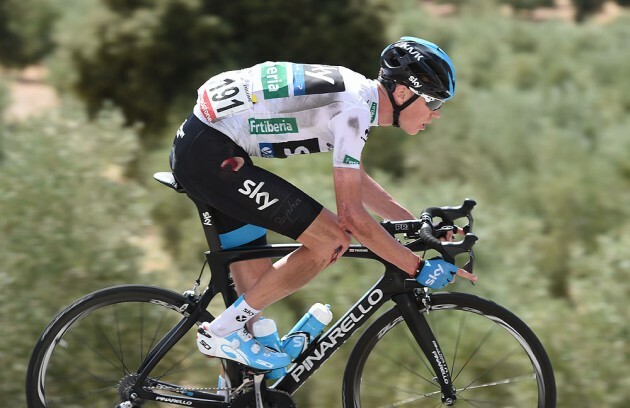 Froome – how much bad luck this year? There’s an unfortunate air to Chris Froome (Sky) this year. When a crash happens now and people hear he has been involved the first thing they say is ‘not again’ before asking is he hurt. He’s had so many crashes this year that we’re surprised he hasn’t been hurt more or lost his bottle. All credit to him he’s the first to admit he’s been down a lot, he is the one who christened himself Crash Froome, and it’s great that it hasn’t affected his ability to descend or tackle technical circuits. Saying that, we do watch him with baited breath in wet conditions. All the teams were talking about this stage before the start and how the cross winds could cause some real damage. Towards the end of the stage the cross winds really picked up and a few teams took advantage. 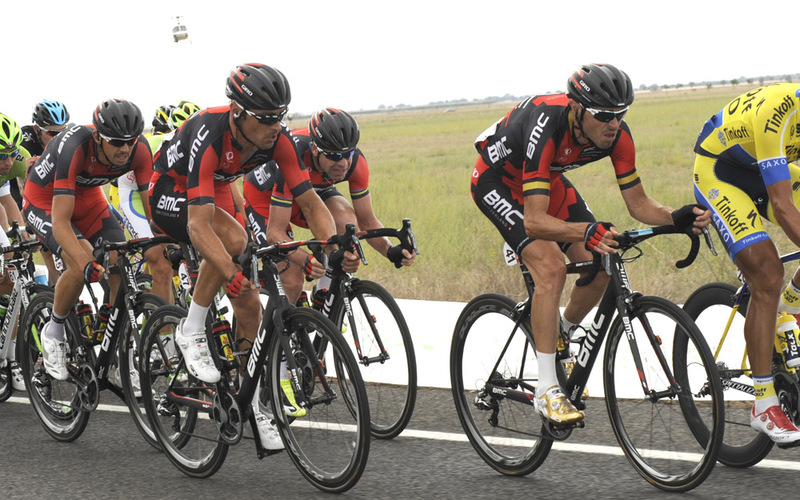 BMC, Tinkoff-Saxo and Omega Pharma-QuickStep along with all the major GC contenders were all riding hard at the front and as expected the race shattered. The helicopter shots showed several groups on the long straight road all riding in diagonal lines in classic echelon formation. There was a brief panic for Movistar as Nairo Quintana failed to stay in the first group but after some hard riding with a few others he got back just in time to finish with the other main contenders. That looked such a hard ride for the peloton on such flat, wide open roads. 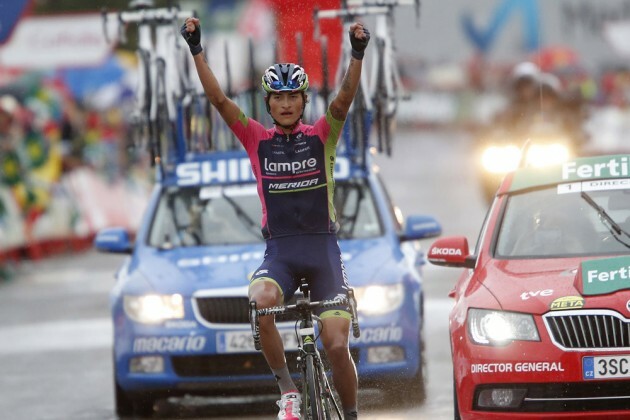 Winner Anancona (Lampre-Merida) had the commentators and headline writers beaming today as they played on his name all the way to the line once it was obvious the Columbian rider was going to win the stage. He was actually well placed to take the overall race lead as well until the big guns started attacking each other on the final climb after Team Sky had set such a ferocious pace leading into it. Winner’s lead came down dramatically but he still had several minutes in hand at the line and plenty of time to celebrate his win. Of the favourites, Contador showed the most promise with a solo attack near the summit finish but the biggest winner of the day was Movistar’s Nairo Quintana who moved into the race lead. The individual time trial is often referred to as the race of truth as there’s nowhere to hide – it’s all about the individual rider’s form. Today showed who was in form and who was lacking. 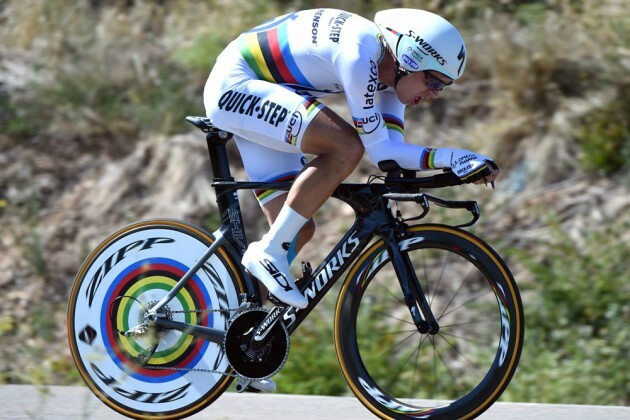 World time trial champion Tony Martin (Omega Pharma-QuickStep) won as was expected but it was the battle between the GC contenders everyone was focusing on. Race leader Nairo Quintana (Movistar) was the biggest loser of the day as he had a high speed crash mid stage which looked very serious at first but thankfully he was soon up and riding on a spare bike as his first one disintegrated. Rigoberto Uran (Omega Pharma-QuickStep) showed he shouldn’t be ruled out with an impressive second place on the stage which moved him up to third on GC while the biggest winner was Alberto Contador (Tinkoff-Saxo) who moved into the race lead. Chris Froome (Sky) had a somewhat disappointing ride finishing in 10th place but is still in 5th overall just 1-18 down. The mountain stages coming up are going to make for some excellent viewing!